Edinburg mayoral candidates Richard Molina, Gina Alamia and incumbent Richard H. Garcia field questions during a forum Wednesday, Oct. 18, 2017, at the University of Texas Rio Grande Valley campus in Edinburg. EDINBURG — Incumbent Richard Garcia and council member Richard Molina have far outspent and outraised Gina Alamia in the race for Edinburg’s next mayor. Over the course of the past three months, Garcia has raised more than $124,000, while Molina raised $25,000 and Alamia just over $1,300, according to their latest campaign finance reports filed with the city of Edinburg Oct. 10. When it comes to spending during the same time frame, Garcia also falls on top. The mayor spent more than $96,000 on the campaign trail, while Molina spent about $67,000 and Alamia about $4,700. More than half of Garcia’s expenditures — almost $62,000 — went to two companies: Carrera Communication and Brando, an advertising agency. Garcia paid Carrera Communication almost $42,000 and Brando about $20,000 for political consulting. He also spent $5,000 on advertising with The Monitor. Molina’s biggest single expense went to Brenda Rodriguez, who earned more than $3,800 for contract work. He appears to be using 2 Mar Media as his political consulting firm, for which he paid $2,000 for its services. The bulk of Molina’s expenses appear to stem from advertising costs and promotional material. Alamia appears to be running a much smaller campaign, at least financially. Her biggest expenditure went toward an event at The Reserve at Social Club, where she spent $1,050. Garcia, on the other hand, appears to have friends in high places, with many of them donating thousands of dollars each. His biggest contribution for the last reporting period came from the Border Health PAC. The political action committee — credited with luring House Speaker Paul Ryan to the area Wednesday afternoon — gave Garcia $10,000. Meanwhile, the Burns Brothers — who previously gave Garcia $25,000 — donated another $8,000 to the mayor’s campaign. 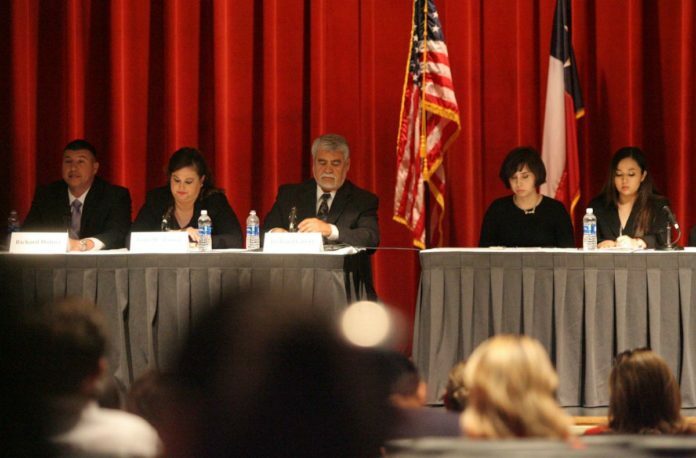 Over a dozen of Garcia’s donors appear to be physicians or part of the healthcare industry, including high-ranking members of Doctors Hospital at Renaissance and the dean of the School of Medicine at the University of Texas Rio Grande Valley. According to Molina’s filling, most of his contributors during the filing period are businesspeople, including engineers and insurance agents. Only two of his reported contributions were for $2,000 or more. Garcia still had about $73,000 left in his campaign fund as of Oct. 10, while Molina reported having reserves of over $110,000. Meanwhile, Alamia had about $1,300 left in her account.